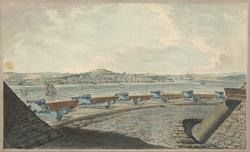 View of Halifax in Nova Scotia by George Isham Parkyns. Halifax was a settlement founded by the British in 1749. It had a well protected harbour which made it ideal maritime base. In 1758 a large dockyard area was built and in 1759, the harbour was used as a centre for the British campaign against the French at Fort Louisbourg. Georges Island is a small island known as a Drumlin located in Halifax Harbour. It’s strategic location meant that a fort was built here and it became an important naval base. George Isham Parkyns (1749-1820), was an English artist who served in the British Army (Nottinghamshire Militia) during the American War of Independence.